So you know sometimes one evening when you have to find that second skein of yarn for the pair of socks you’re working on, so that you can finish the first one on the bus and then take the second skein with you as a sort of security blanket, and then you go to your shelf of sock yarn and have no idea where that skein is, and so you just pull the whole mess off of the shelf onto the floor and dig through it on the floor instead because mess seems a lot easier than order? That’s about the state of my brain today. Can’t wait for the weekend. I feel so much better about my stash issues with just this one little picture! Happy knitting weekend! OOooh! That colour is beautiful! Love it, and the mess! If you have to have a mess, that’s an awlfully pretty mess to have! Ha. My stash looks like that all the time. i agree — thanks for sharing this pile of yarn on the floor! It’s so true. It’s so much easier sometimes to scatter it out and it makes me feel better somehow. Of course the getting it all back in order is another issue. Have a great weekend and I’m glad you found the skein! thank heavens for upsides. and for fridays, too! Sometimes controlled chaos does make things easier to find. But then you have to put the chaos back in the box. Sadly, this seems to be the story of my life. Snowing here in Minnesota. Hope you folks are getting better weather than this — it’s starting to STAY. LOVE that colourway. Those jaywalkers will be stunning. You’ve almost convinced me to try Jaywalkers. On the plus side, that’s a very pretty Jaywalker. Your Jaywalkers look so nice in that color! Secretly, wasn’t it fun to play with all those lovely skeins? 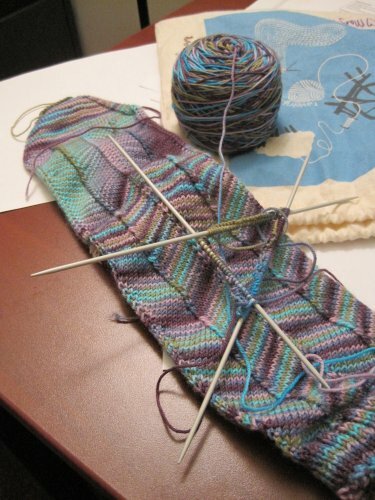 The sock sure suits the yarn – nicely done! 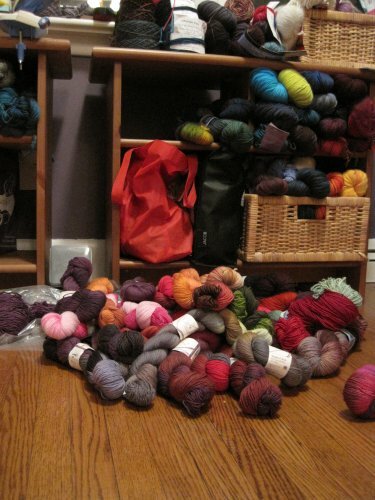 Yikes, that’s quite the yarnsplosion! Then again, it’s not like my fabric stash hasn’t ever avalanched all over my apartment. The sock looks lovely, though. Hope you’re having a great weekend! Pretty mess! Right now I’m in disarray, too. Oodles of swatches and needles all dumped into tote bags. Blech. Gorgeous yarn! What is it?